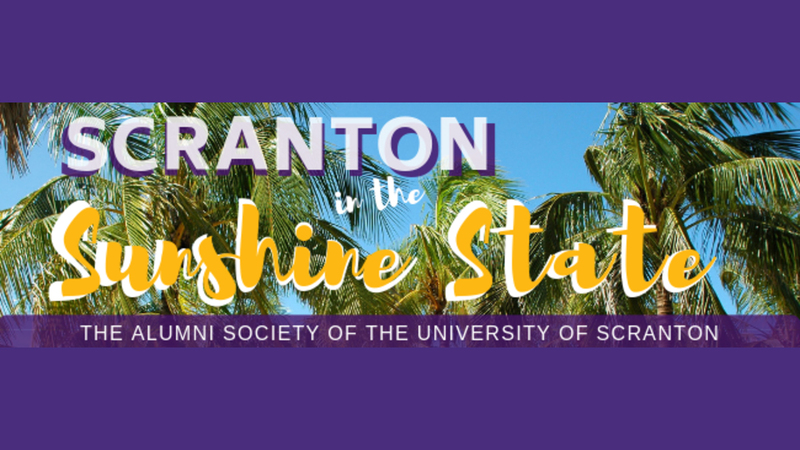 The University of Scranton will hold two Scranton Gatherings in the state of Florida during the month of February. The first, featuring cocktails and hors d'oeuvres, will take place Friday, Feb. 22 at the The Beach House of the Ritz-Carlton Naples, 280 Vanderbilt Beach Road, Naples, FL, at 5:30 p.m. The second, sponsored by Edward and Christine Kane P'12, '14, will take place Sunday, Feb. 24, at The Harbourview Ballroom of The Club at Admirals Cove, 200 Admirals Cove Boulevard, Jupiter, FL, at 11 a.m. To register for either reception, visit this link. For more information on these complimentary events or to register by phone, contact Marge Gleason P'14, '17 at 570-941-5997, or email alumni@scranton.edu.